Every grower and retail garden center loves the first rush of spring sales. The golden ticket for our industry is figuring out ways to extend that spring retail rush. Finding ways to bring consumers into the garden center beyond the traditional spring planting season means more traffic and more sales. That golden ticket might just be season extenders. Season extenders are plants that hold up in the heat. These are the varieties that are colorful and captivating for consumers as summer sets in. 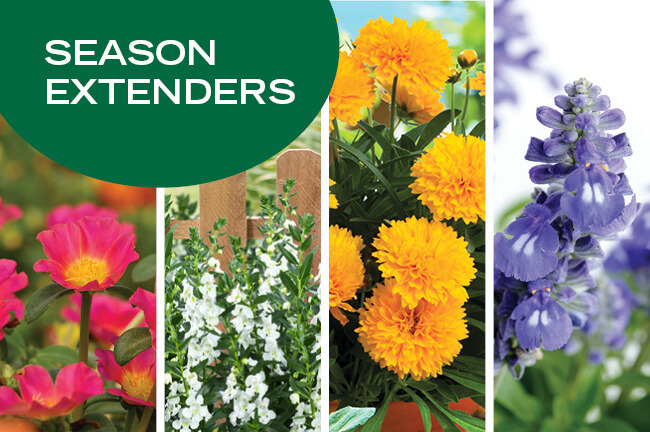 These plants are perfect for replacing spent spring annuals, switching out baskets that are looking tired and rejuvenating containers for the hot summer season. SALLYFUN™ Salvia loves the sun and heat. Each variety in this series is moderately drought tolerant once it is established and provides great color in the garden center and throughout the summer in the home garden. This bee and butterfly magnet is available in five colors and is a stunning landscape plant. It also adds great color and height to patio combos. Portulaca are known for vibrant, long-lasting color that loves the sun. The PAZZAZ Nano™ series boasts big flowers that stay open longer during the day. This heat tolerant variety is perfect for growers as it stays compact and then blossoms into a big ball of color for the consumer. This series is great for quart programs at retail but will also fill out and make a colorful compact hanging basket. The SOLANNA™ Coreopsis series puts a new spin on this classic perennial. SOLANNA™ flowers in the first year with no cooling needed. It also flowers exceptionally early, with large blooms covering the plants as early as April and lasting through October. This series is perfect for both early and late season sales. For the home gardener, SOLANNA™ is a great landscape or container plant. It is very low maintenance, heat, and drought tolerant plant. This early flowering Angelonia is very floriferous, with large blossoms covering the plant all summer long. The ALONIA series has good heat tolerance and grows to a nice size in the garden. Recommended for quarts and 2.5 quarts, ALONIA™ is available in eight stunning colors. Home gardeners are sure to find one they love.